Desolation. 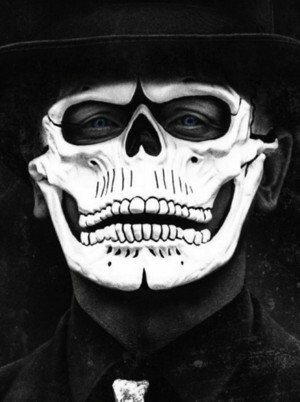 Deprivation. In a move that mirrored the incarceration of Jewish people, Gypsies, and numerous marginal groups into European concentration camps during World War II, the North American government also interred Japanese Americans into relocation camps. 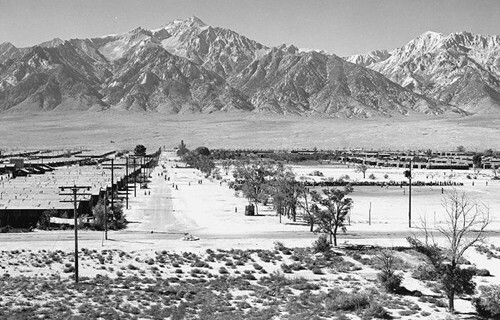 Once such camp was Manzanar, a few hours north of Los Angeles in the desert. The majority of Japanese detained were native-born Americans or legal US residents. Located about 220 miles north of Los Angeles, the Manzanar War Relocation Center was the first of ten camps established to detain approximately 120,000 individuals of Japanese descent in the wake of the December 7, 1941 attack on Pearl Harbor. 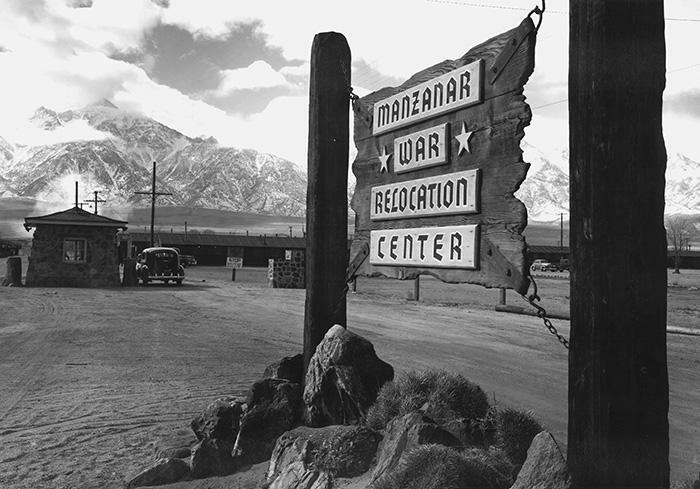 Ultimately, Manzanar held 11,070 individuals, more than 90% from Los Angeles. 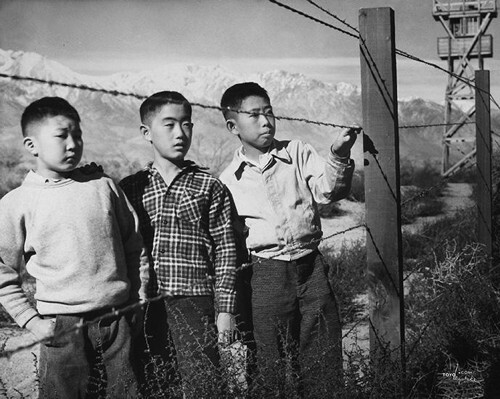 The Skirball Cultural Center presents Manzanar: The Wartime Photographs of Ansel Adams, featuring fifty little-known photographs by Ansel Adams (1902–1984) that depict the treatment of Japanese Americans at the Manzanar incarceration camp in central California. Taken during World War II, the black and white works were originally published in Adams’s book Born Free and Equal (1944) in which he protested what he called the “enforced exodus” of a minority of citizens. On view at the Skirball from October 8, 2015–February 21, 2016, Manzanar: The Wartime Photographs of Ansel Adams offers insight into a disquieting period in California and American history. In the exhibition, Adams’s portfolio is complemented by the work of contemporaries Dorothea Lange and Toyo Miyatake, who also photographed Manzanar during the war. Also on view are documents, publications, propaganda materials, artifacts, and artwork detailing life and conditions at the camp. Manzanar: The Wartime Photographs of Ansel Adams was organized by Photographic Traveling Exhibitions, Los Angeles, California. 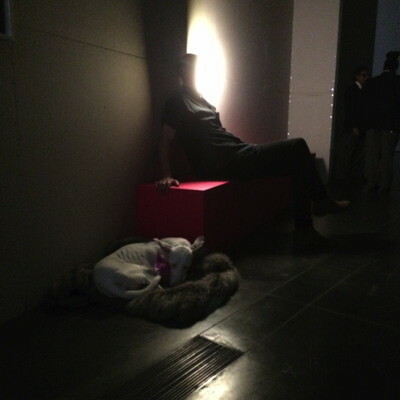 It is presented at the Skirball in association with the Japanese American National Museum. Concurrently, the Skirball presents Citizen 13660: The Art of Miné Okubo. Based on an illustrated memoir of the same name, this companion exhibition features the work of Japanese American artist Miné Okubo (1912–2001), who recorded her everyday struggles at two incarceration camps through poignant pen and ink drawings and incisive commentary. Citizen 13660: The Art of Miné Okubo is also presented in association with the Japanese American National Museum. 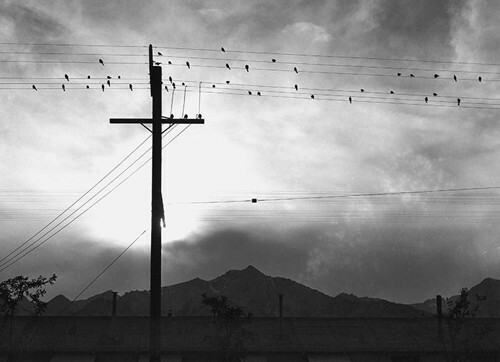 Ansel Adams, Birds on Wire, Evening, 1943. Gelatin silver print (printed 1984). Private collection; courtesy of Photographic Traveling Exhibitions. There had been a large Japanese population in the US since the early 20th century. 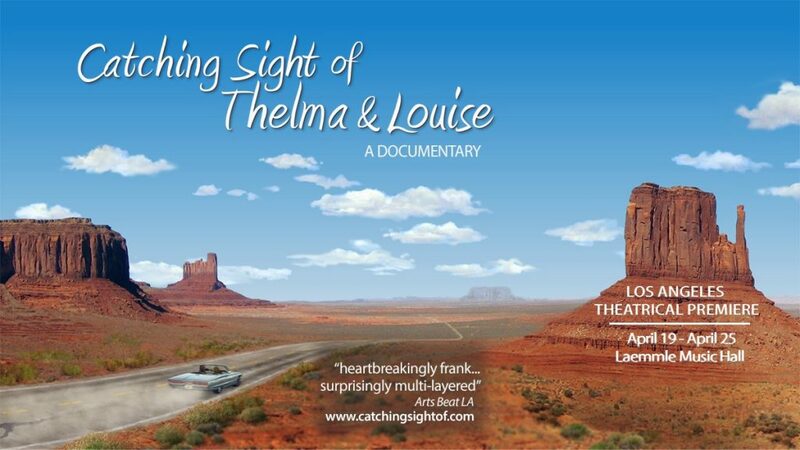 Many were farmers and landowners, and land ownership issues often flared. After the Japanese government bombed Pearl Harbor, underlying racism erupted and mistrust prevailed. Anti-Japanese propaganda began to circulate in the media, including caricatures and blatant racism. 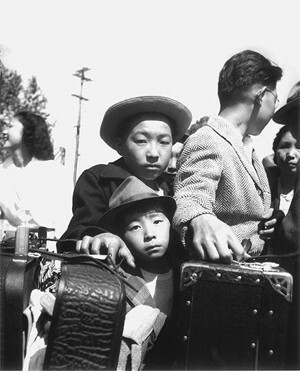 Dorothea Lange, Young evacuees of Japanese ancestry wait their turn for baggage inspection, Turlock, CA, 1942. Gelatin silver print (printed later). Private collection; courtesy of Photographic Traveling Exhibitions. The exhibition opens with vivid examples of anti-Japanese propaganda, including cover art and articles from prominent publications such as Collier’s, LIFE, Vanity Fair, and Time. The pre-evacuation period is observed in numerous photographs Dorothea Lange took for the War Relocation Authority in 1942, one year prior to Adams’s own visit to Manzanar. Lange’s poignant images—many of them impounded for negatively portraying the government—document Japanese Americans being forcibly relocated, leaving behind shops and schools, boarding crowded trains, and encountering primitive living quarters at the camp. In 1942, and pressured by the fear and paranoia sweeping the nation, President Franklin D. Roosevelt issued Executive Order 9066 authorizing the Secretary of War to “exclude” any residents from prescribed West Coast military areas in order to protect “against espionage and sabotage.” The War Relocation Authority implemented the order to “evacuate” all persons of Japanese origin. 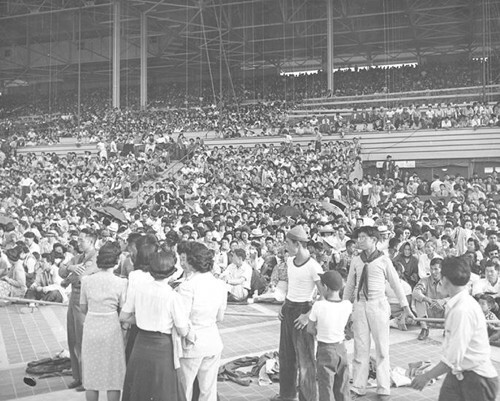 Santa Anita Racetrack was used as an assembly center for relocation, with thousands of people forced to sleep in horse stalls. When they got to the camps, some evacuees had to build their own barracks. George T. Ishizuka, Santa Anita Racetrack as Assembly Center, ca. 1942. Courtesy of the Japanese American National Museum. The pre-evacuation period is observed in numerous photographs Dorothea Lange took for the War Relocation Authority in 1942, one year prior to Adams’s own visit to Manzanar. Lange’s poignant images—many of them impounded for negatively portraying the government—document Japanese Americans being forcibly relocated, leaving behind shops and schools, boarding crowded trains, and encountering primitive living quarters at the camp. Dorothea Lange captured the dust building up in the landscape, offset by a tattered US flag. Her compassionate photography indicated the dust, the desolation, the cold weather and extreme conditions the inhabitants endured for three years. Although employed by the government as a documentarian, many of Lange’s images were impounded and censored until after the war had ended. Of note in this marvelous exhibition is Ansel Adam’s photo of Toyo Miyatake, an inmate who also photographed Manzanar during the war. He did so secretly at first, with a hand made camera. It was confiscated numerous times yet returned. Eventually Miyatake was permitted to take photos of Manzanar and its inhabitants, providing a non-Japanese person triggered the shutter. Eventually even that ludicrous restriction was lifted and Miyatake’s insightful photographs were revealed. There is a short film of Miyatake’s grandson demonstrating how his grandfather’s camera was built and functioned. Toyo Miyatake, Boys Behind Barbed Wire (Norito Takamoto, Albert Masaichi, and Hisashi Sansui), 1944. Gelatin silver print. Courtesy of Alan Miyatake, Toyo Miyatake Manzanar Collection. The Skirball will present several public programs related to the exhibitions. There will be a free matinee series exploring prejudice and patriotism in America during and following World War II; a reading by famed author Isabel Allende, whose forthcoming novel, The Japanese Lover, follows a couple torn apart when the young man and his family are sent to an incarceration camp; a book discussion group exploring novels by Asian American writers Maxine Hong Kingston, Chang-Rae Lee, and Ruth Ozeki; a course on Japanese art and the West; and a special three-session class and photo-tour, offered in partnership with Otis College of Art and Design, that will culminate in a weekend trip to the Manzanar National Historic Site. Additional public programs may be announced; information will be posted on the official website here. As part of its school outreach program, the Skirball will offer an exhibition school tour for middle and high school classes. By studying and discussing photographs, artifacts, and first-person accounts of individuals who fought to preserve their civil liberties, students will learn about critical moments in U.S. history and consider their relevance to American society today. Also designed to complement the exhibition, an intensive high school residency program will explore some of the critical civic issues facing students today in the diverse cultural landscape of Los Angeles. Through research, writing, and audio production, participants will investigate American identity and democracy, and work with a professional radio producer to create original, collaborative works to be presented at their school and at the Skirball. Finally, through the Skirball’s teacher professional development initiative Teaching Our World Through the Arts, K–Grade 12 educators will take inspiration from Adams’s photographs of Manzanar to focus on photography, documentaries, personal narrative, and engagement with contemporary issues. The Skirball Cultural Center is located at 2701 N. Sepulveda Blvd., Los Angeles, CA 90049. Museum hours: Tuesday–Friday 12:00–5:00 p.m.; Saturday–Sunday 10:00 a.m.–5:00 p.m.; closed Mondays and holidays. Admission to exhibitions: $10 General; $7 Seniors, Full-Time Students, and Children over 12; $5 Children 2–12. Exhibitions are always free to Skirball Members and Children under 2. Exhibitions are free to all visitors on Thursdays. For general information, the public may call (310) 440-4500 or visit skirball.org. The Skirball is also home to Zeidler’s Café, which serves innovative California cuisine in an elegant setting, and Audrey’s Museum Store, which sells books, contemporary art, music, jewelry, and more.